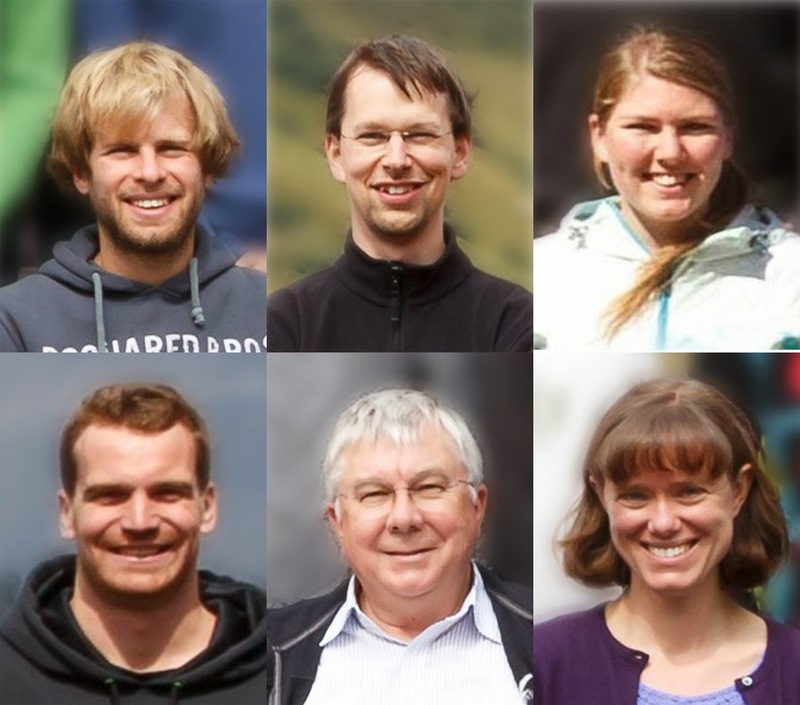 From left to right: (top row) Bernardo Casabone, Konstantin Friebe, Birgit Brandstätter, (bottom row) Klemens Schüppert, Rainer Blatt, Tracy E. Northup. Affiliation: Institut für Experimentalphysik, Universität Innsbruck, Austria. One of the largest challenges in quantum information science stems from the fact that to date no truly scalable quantum computer has been built, i.e., current devices only contain a few quantum bits (qubits). However, in order to access regimes where the power of quantum computation really comes into play, one would need scalable architectures with many qubits. One approach for solving this issue is called distributed quantum computing. It consists of many small-scale quantum computers that are linked via photonic channels in close analogy to the internet or the “cloud” . In this way, many small quantum computers can be linked together to make one large computer. In this approach, the challenge consists of faithfully transferring quantum information between remote small-scale quantum computers via photonic channels. Quantum interfaces for this purpose can be built using cavity quantum electrodynamics systems. In such a system, the stationary qubits for computation are kept inside a cavity, also known as an optical resonator, i.e., between two mirrors. These mirrors enhance the interaction between the stationary qubits and photons (“flying qubits”), so that faithful transfer of quantum information from matter to light becomes possible. In fact, the mirrors make it possible to generate a single information-carrying photon from a stationary qubit and to be able to send this photon to another quantum computer with high efficiency . Figure 1: Schematic of the setup. Two calcium ions (green spheres) are trapped inside an optical resonator (mirrors). By addressing the ions with laser beams at wavelengths 729 nm (global 729, addressing 729) and 393 nm, it is possible to prepare them in an entangled state with controllable phase, and a single photon can be generated in the cavity (red standing wave profile). The polarisation of the photon carries one qubit of information. After the photon has left the resonator, it is analysed using waveplates (λ/2, λ/4) and a polarising beam splitter (PBS), which splits up the two orthogonal polarisations H (horizontal) and V (vertical). The photon is then detected at one of two avalanche photodiodes (APD1 and APD2). (This Figure is from reference ). In our recent experiment at the University of Innsbruck, Austria, we trapped two calcium ions inside an optical resonator . In this case, the ions constitute the small-scale quantum computer. Ions are well-suited for this task, as an extensive toolbox for their preparation, manipulation and readout exists. The two ions were laser-cooled and prepared in an entangled state by manipulating their electronic and motional states with a laser field. Entanglement means that the two ions have “lost their individuality” and have to be described as a collective system with collective qualities. In this case, it is the electronic states of the two ions that are entangled with one another. This entangled state can be characterized by a phase, i.e., a number between zero and 2π. By controlling the phase of the entangled state of the two ions, it was possible to either enhance the probability to generate a photon in the cavity (phase 0) or to suppress the generation of a photon (phase π). The first case is called superradiance, while the suppression is called subradiance. Figure 2: Probability of detecting a photon as a function of the time after the photon generation is started. The blue circles show the photon detection probability for the superradiant case (entangled state with phase 0), while the brown diamonds represent the subradiant state (entangled state with phase π). For comparison, the case of the two individual ions is shown (open triangles). For the superradiant case, the photon is produced faster than for a single ion, while in the subradiant case, photon generation is suppressed. Lines are simulations. (This Figure is from reference ). We next encoded one qubit of information in the state of two entangled ions, that is, we used two “physical qubits” as a single “logical qubit”. The information stored in this qubit was then mapped onto the polarisation state of a single photon. By analysing the polarisation of the photon after it had left the resonator, we were able to show that the transfer of information was more faithful if the two ions were in the state with phase 0 than for a single ion. The efficiency of the process was higher, too. 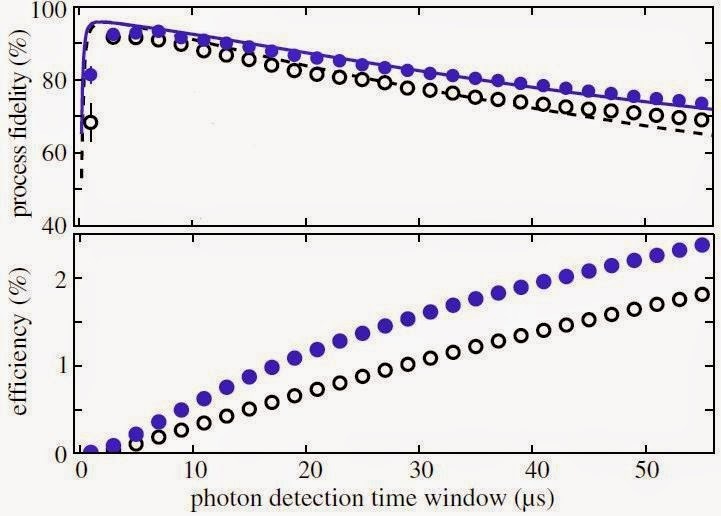 Figure 3: Process fidelity (upper panel), the measure for the faithfulness of the transfer of quantum information, and efficiency (lower panel) as a function of the time after the photon generation is started. Blue filled circles are data from the superradiant entangled state, while open black circles are data from a single ion. Both process fidelity and efficiency are higher for the case of two entangled ions in the superradiant state. Lines are simulations. (This Figure is adapted from reference ). In conclusion, by encoding quantum information in entangled states of more than one qubit, a better, i.e., more faithful quantum interface can be built, which is important for distributed quantum computing. Additionally, by choosing the phase π instead, qubits can be completely decoupled from the interface. This is interesting for future quantum computers consisting of long arrays of ions, where one might need a selective interface for just certain qubits, while the others remain undisturbed. T.E. Northup, R. Blatt, "Quantum information transfer using photons", Nature Photonics, 8, 356 (2014). Abstract. B. Casabone, K. Friebe, B. Brandstätter, K. Schüppert, R. Blatt, T. E. Northup, "Enhanced quantum interface with collective ion-cavity coupling", Physical Review Letters, 114, 023602 (2015). Abstract. C. Russo, H. G. Barros, A. Stute, F. Dubin, E. S. Phillips, T. Monz, T. E. Northup, C. Becher, T. Salzburger, H. Ritsch, P. O. Schmidt, R. Blatt, "Raman spectroscopy of a single ion coupled to a high-finesse cavity", Applied Physics B, 95, 205 (2009). Abstract.